open on Saturday, April 20. * Bingo For Books - 2PM All Ages Free Books & Fun! * Young Adult Book Discussion Group - 5:30PM - Final discussion of "Children of Blood & Bone" & starting discussion of "The Uglies" - Stop in for copies of the books. * No CookBook Club this Month - Next Cookbook Club will be held on May 1. 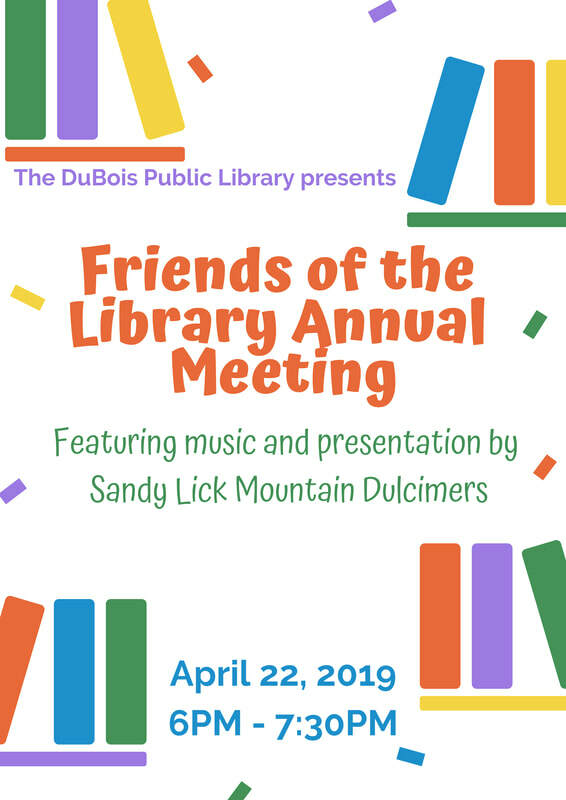 The mission of the DuBois Public Library is to provide for the education, information, and recreation of the DuBois community through print, digital and virtual materials, programming and resources that promote literacy and knowledge at every age. The DuBois Public Library is located on the corner of South Brady Street and Washington Avenue. Metered parking is available in our upper and lower lots. Handicapped parking and building access are available for all floors of the Library through the use of an elevator. The elevator is located directly inside the lower entrance and opens into the Adult Department located on the upper floor.